Read-out Instrumentation Signpost: Self-laminating SBP labels. 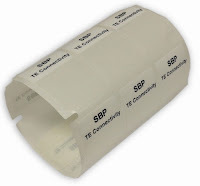 Wrap-around markers for wire and cable print easily and able to withstand extreme heat to 110 Deg C.
TE Connectivity (TE) has made improvements to its SBP vinyl label liner to work seamlessly with TE thermal transfer printers having movable sensor positions. These labels are used to identify wire and cable in harsh industrial environments. TE’s SBP labels are now available in two liner formats. For thermal transfer printers with a movable sensor, the left edge sensor slot on the liner provides the sensor detection for printing accuracy. Our original liner for SBP labels is still available for printing with thermal transfer printers having a fixed sensor position. These labels have three reference holes for printer sensor detection. When ordering SBP labels, a ‘T-200’ is used at the end of its description to reference the three hole liner. The SBP labels withstand temperatures from minus 40 degrees Celsius up to 110 degrees Celsius (minus 40 F to 230 F). The label also is qualified against standards for flammability, resistance to harsh chemicals and weather. In addition, the labels have certification under the UL 817 standard for power cords as well as the UL 2238 standard for cable assemblies. The UL 817 category recognizes the flexibility of SBP labels to wrap around cables, so they are more logical and straightforward for buyers. SBP labels can be applied indoors or outdoors as self-laminating wrap-around labels that sit flat around cables for a tidy finish or as flagging labels that stand out from cables so that maintenance technicians can sort them with ease. Their ability to withstand exposure to oil, solvents and water makes them ideal for defense, industrial, telecoms, electrical, electronics and automotive applications. The SBP labels are based on a thermal transfer printable vinyl film with a permanent acrylic adhesive. They have a white printable area that can be over-laminated with a transparent section. The over lamination protects the printed area and enables a higher level of print durability. TE’s SBP labels come in a variety of sizes and are usable down to a 2.0mm diameter, even on Fluoropolymer wire jackets. The labels are fully free of substances of very high concern (SVHC), in line with TE’s drive to comply with the European Community’s REACH (Registration, Evaluation, Authorisation and Restriction of Chemicals) legislation. SBP labels do not contain any declarable or prohibited substances from the UNIFE Railway Industry Substances List. See further information covering RoHS and REACH compliance here.